If you didn’t catch the latest updates on the #GaimanGate fiasco, eventually I was offered the opportunity to go to the Rotterdam event because spots had opened up and I was on the waiting list (or, you know, they saw my blog post). 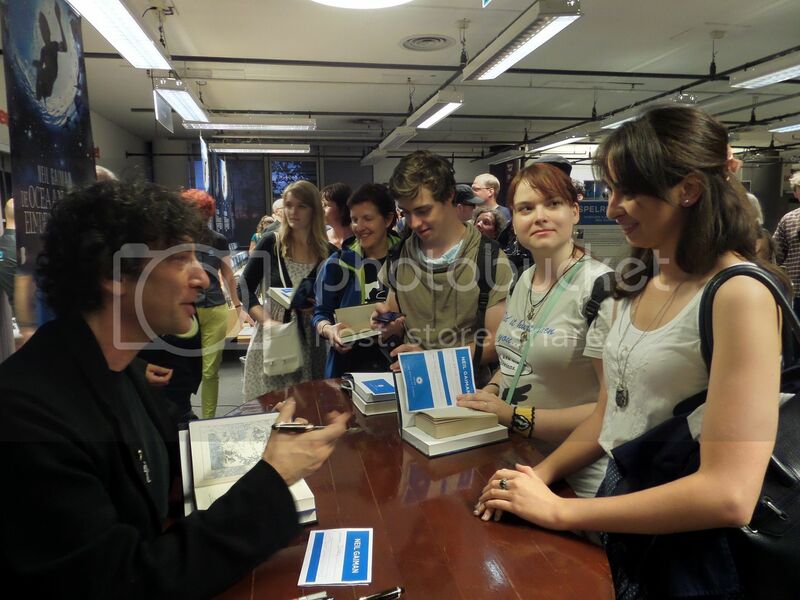 So this past Friday, I had the amazing and exciting opportunity to meet Neil Gaiman. It was… incredible. 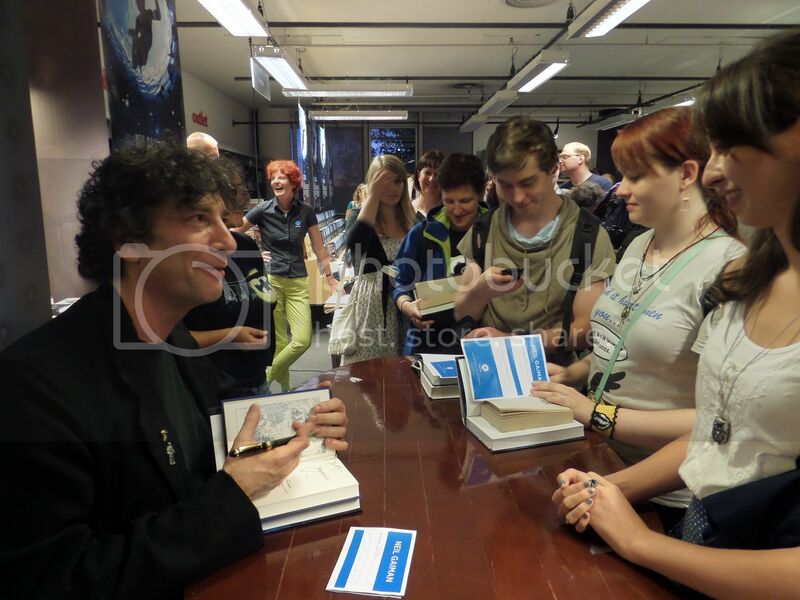 I felt immensely guilty for not having read his books yet *cough* but the man is just amazing. He has such charisma, and I love his dry sense of humor. I WILL FIX THE NOT HAVING READ HIS BOOKS YET THING SOON. The organization still wasn’t very good, sadly. It’s still Polare. Though undoubtedly it’s better than in Utrecht. People arrived way too close to 7 pm, the starting time of the event, and then still had to buy the book. 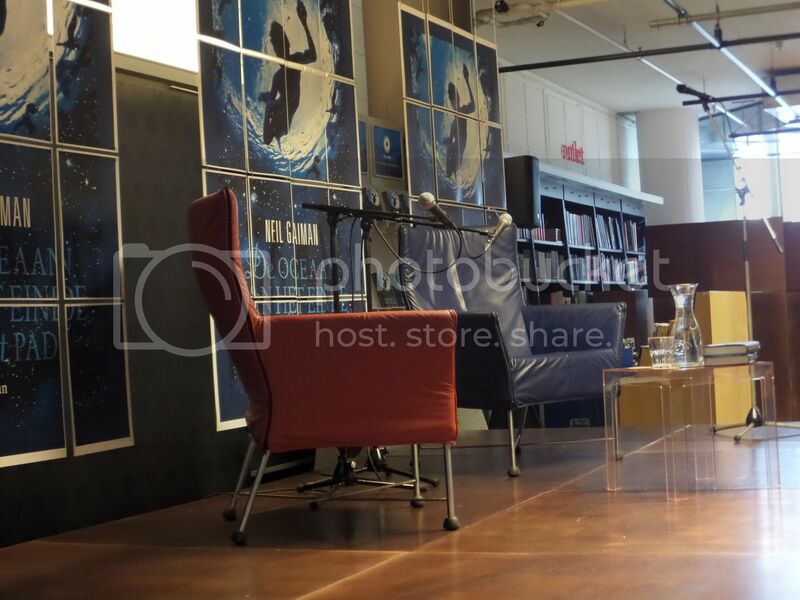 The store wanted to hold on to a strict policy of having people pay for the books before the interview would start. So you can imagine the result. It started at least 20 minutes late, and by that time they still hadn’t processed all the purchases. *sigh* BUT. I already had my books. I was plenty on time. We got really nice seats. 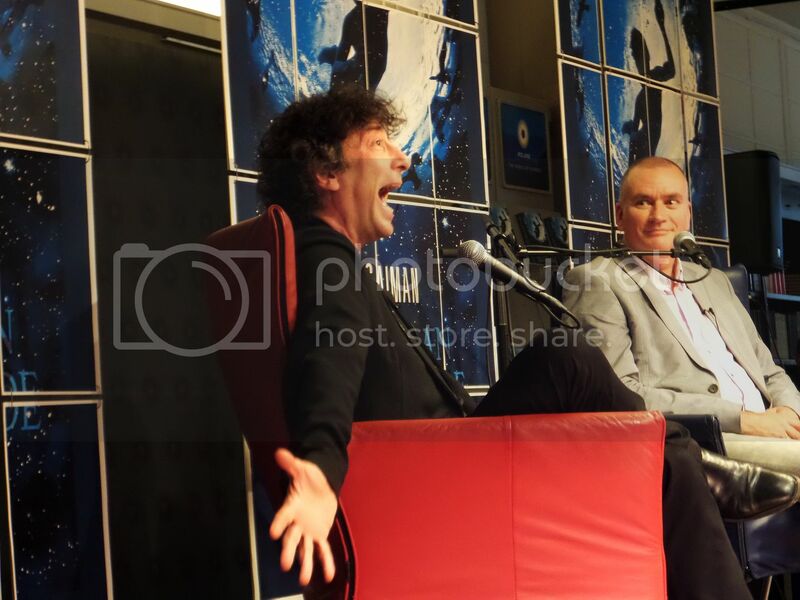 And when Neil Gaiman finally appeared, all my qualms disappeared. Marcel van Driel, a Dutch author, interviewed him for us, and it was just amazing. They started off talking about the Netherlands. Surprisingly, at least to me, Neil really likes Holland – and in fact, his wife’s sister lives in Utrecht and married a Dutchman. So he even said, “I’m practically Dutch by marriage.” Okay, you know how to get on our good sides, haha. He also talked about the Dutch language, which he admits he’s terrible at. He says it’s funny because when you hear Dutch as an English person, it almost sounds English, so he tries to make the Dutch he hears into English words and… it doesn’t work. He even made some comment about how hearing Dutch sounds like people plotting a galactic invasion when he’s drifting off to sleep. They then got to talking about The Ocean at the End of the Lane. Basically, it’s a culmination of two stories from his childhood: one where a lodger at their house stole their car, a Mini, and then committed suicide in it at the end of the lane (which he was never told as a child, and when filled in later, his reaction was, “You mean something interesting happened when I was young and nobody told me?? ?”), and one about a farm at the end of the lane which was once more or less the property of William the Conqueror. When he discovered that, as a child, he thought the farm, in its exact state, red bricks and all, existed 1000 years ago. And he wondered whether the people who owned it also existed 1000 years ago. Then he decided they did. Basically, The Ocean at the End of the Lane is inspired by these two stories, and they are the starting point of the novel. He also admitted that it’s a fictional story, it’s not an autobiography as some interviewers have asked, but it is basically him in the story. So he started writing, and it was getting a bit long. So instead of a short story, he thought it would be a novelette. He kept writing, and it appeared to be a novella, at which point he called his publisher and said, “Just a heads up, I’m writing a novella. I know they are hard to publish, but just wanted to let you know.” (Not a direct quote.) Then he kept writing…. and when he was done he called his publisher and said, “It appears that I’ve written a book. 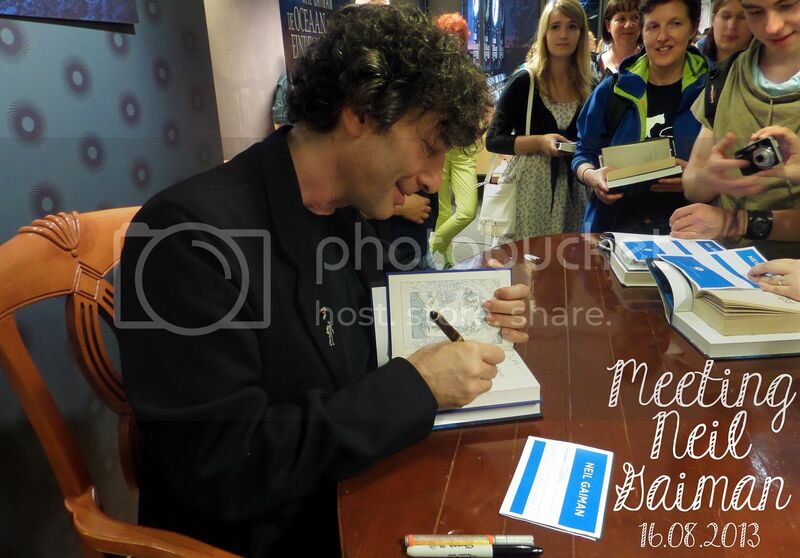 Sorry…” The way that writing comes so naturally to this man is truly inspiring. Anyway, when his wife, Amanda, was done in Melbourne, she traveled to Dallas, Texas, to mix the album, and Neil flew there to type up the book he had handwritten. (He hand writes his books. I’m stunned guys.) And each day, after she got home from mixing, he would read her what he had typed up that day. I melt at their sweetness, I just can’t even. What he loves about The Ocean at the End of the Lane is how diverse the reviews are. He admitted that if he pulled multiple reviews and put them next to each other, you probably wouldn’t be able to tell they are about the same book. Some call it fantasy, some call it science fiction, some call it realistic fiction, some call it just literary. Whereas his other novels typically fall into distinct categories, Ocean is really up to the reader’s perspective. This makes me excited to read it. I wonder what I’ll categorize it as! Neil Gaiman is humble and awesome. Anyway, a few other stories came around… One about how even he has days when he doesn’t feel like writing and “the most important thing in the world is alphabetizing the spice rack”. Basically, even though he is certainly quite famous and has a good following, he has all the same struggles as other writers. 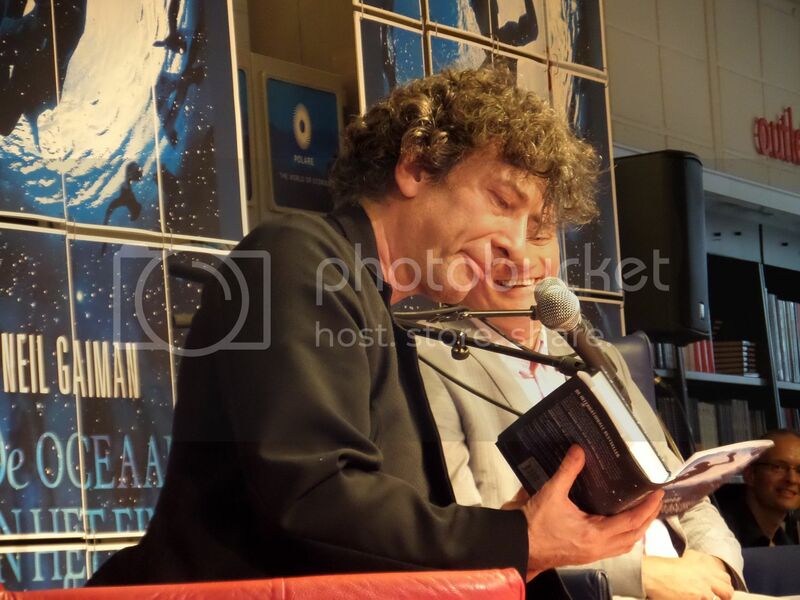 He’s particularly stressed now with writing the prequel for The Sandman for its 25th anniversary this December, because The Sandman has sold over 25 million copies in the meantime, and he feels like all those people are reading over his shoulder and judging him. And the last question of the interview was a shout out to the Doctor Who fans – if he were the Doctor for a day, who would he choose as his companion? And as an addendum: anyone in the universe except Amanda. He chose for Tom Baker, the reasoning being that, if he were to run into Daleks, which is likely if you’re the Doctor for even a day, if he had Tom Baker next to him, with the hat and the scarf, the Daleks would have him in their database and aim for him – leaving Neil free to run away and live another day. Brilliant. The end of the interview marked the beginning of the signing. There was a surge of people and somehow, three different lines formed that all blended into one — basically, it was a huge mess. People were anxious to get to the front, so there was some pushing, and it became extremely hot. But it was well worth the wait. 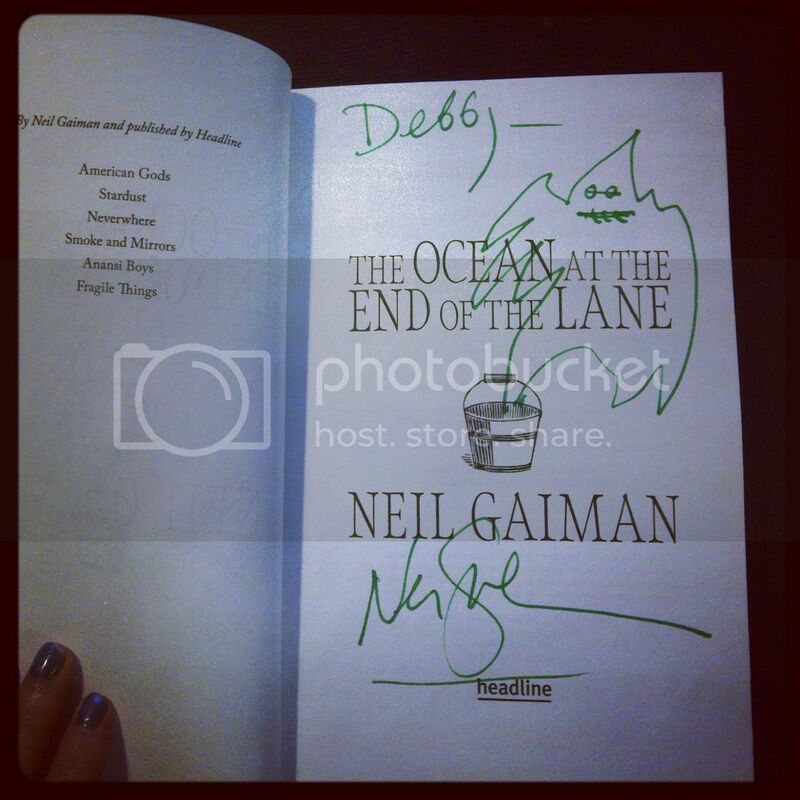 When I finally got to the front and handed my books to Neil, with my name on a slip so he knew how to sign it, I said I was from Snuggly Oranges, and he looked up and exclaimed, “Oh you’re the Snuggly Oranges person!” Okay, this shouldn’t have shocked me so much, since he’s replied to my tweets about the #GaimanGate fiasco and he retweeted the post and everything, but that such a huge author remembers and recognizes me even within hours of Twitter contact is stunning to me. He immediately reached to shake my hand. 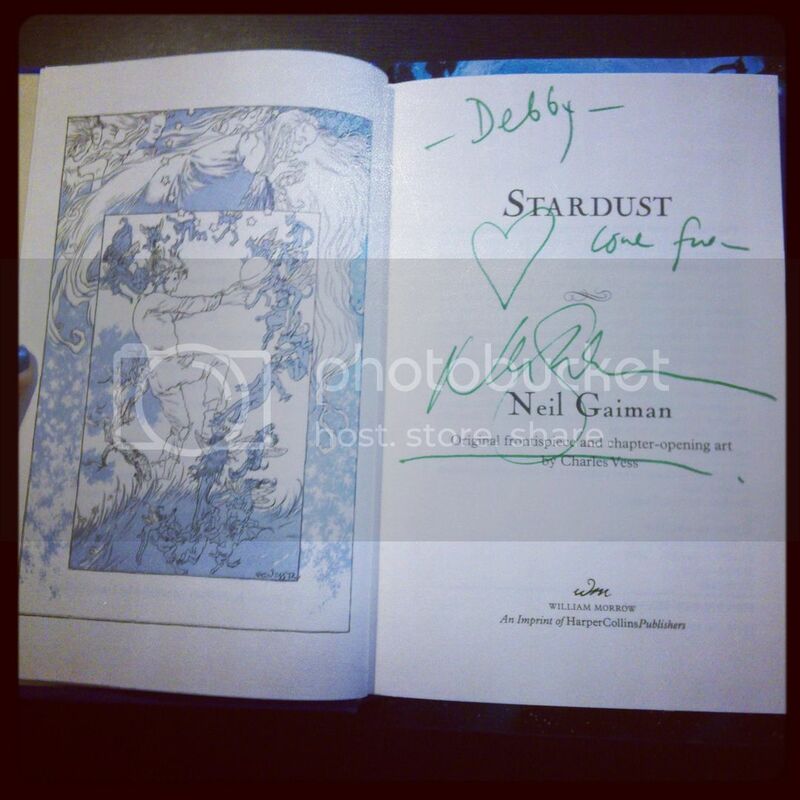 He thanked me for blogging, and said the post was fantastic and quite illuminating. He was upset about how they organized the event in Utrecht, and apologized for it. He’s amazing guys. He even said he would have the power to make them do something – change it to a different venue and let everyone in or whatever, but he sadly couldn’t because of time pressure – he really had to leave to Lowlands right after that event. Seriously. Amazing. Somehow, I managed to say words back, but I don’t really remember what I said. Sadly. I’m just weird. 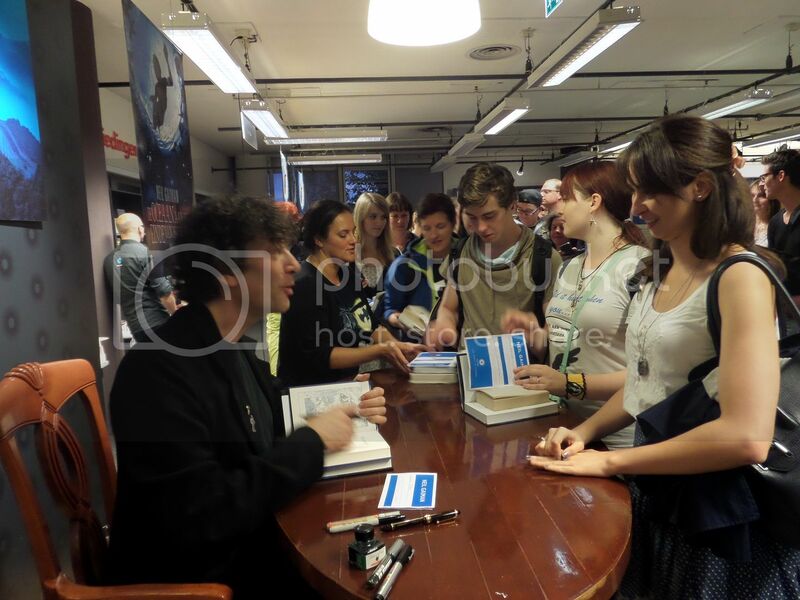 But he really took an interest – actually kept talking to me while already starting to sign the books of the next person in line (sorry!!) and shook my hand again when I left. My life is made. I don’t. I can’t. Uh oh, we’re talking just a bit too long. Girl behind me getting antsy. And of course, I have two beautifully signed books now, which I will treasure for the rest of my life and will be reading ASAP. Picture credits for all of the above go out to the lovely @nosinne, since I am an idiot who forgot her camera, lawl. Cool report! Nice to read it all back. And I agree about the organisation still not being very good – especially the three converging lines was just silly, that could've been handled way better. But the important thing is Neil was there and he was awesome. 🙂 I should probably get working on my own report soon. Two tiny squabbles though: I'm fairly sure Neil said Dutch sounded like people were plotting a galactic invasion, not an assassination, when he's drifting off to sleep. And the farm at the end of the lane wasn't really William the Conqueror's property – at least not directly, only in a vague 'the monarch owns everything in the country' kind of way. It's mentioned in the Domesday Book (http://en.wikipedia.org/wiki/Domesday_Book),” target=”_blank”> http://en.wikipedia.org/wiki/Domesday_Book),” target=”_blank”>(http://en.wikipedia.org/wiki/Domesday_Book), which was a survey of all the landowners' property in England and Wales. It was made mostly for tax purposes after William gained the crown. Like you, I haven't read any of his books but The Graveyard book is already on my TBR list. THIS IS AMAZING. I'm so glad you got to go at the end of it all!! AND I'm glad he remembered you. The Interwebs is a powerful place. Right, it was galactic invasion. Thanks. And I know about the Domesday Book, but I hardly felt like this was the place for a history lesson. So I shouldn't be jealous, because we even get more signing, here . . . but . . . but . . . I can't. 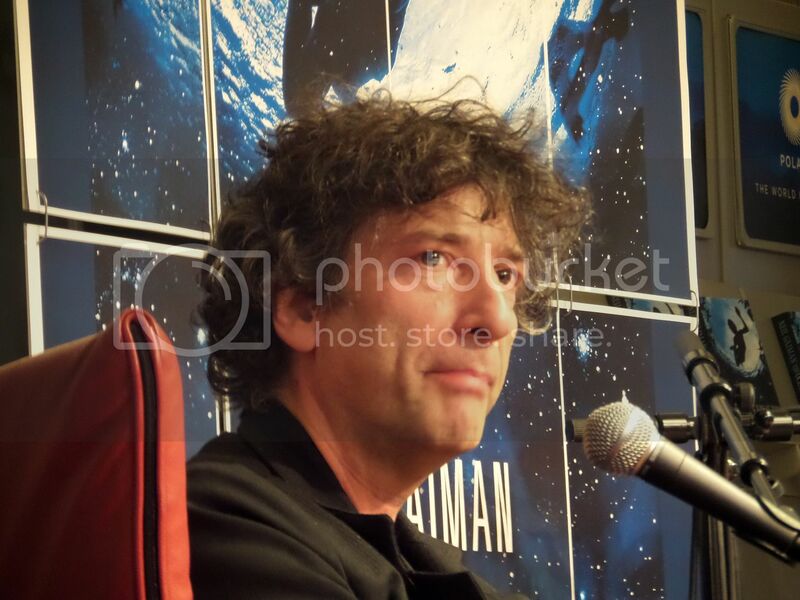 It's NEIL GAIMAN. And he remembered you. 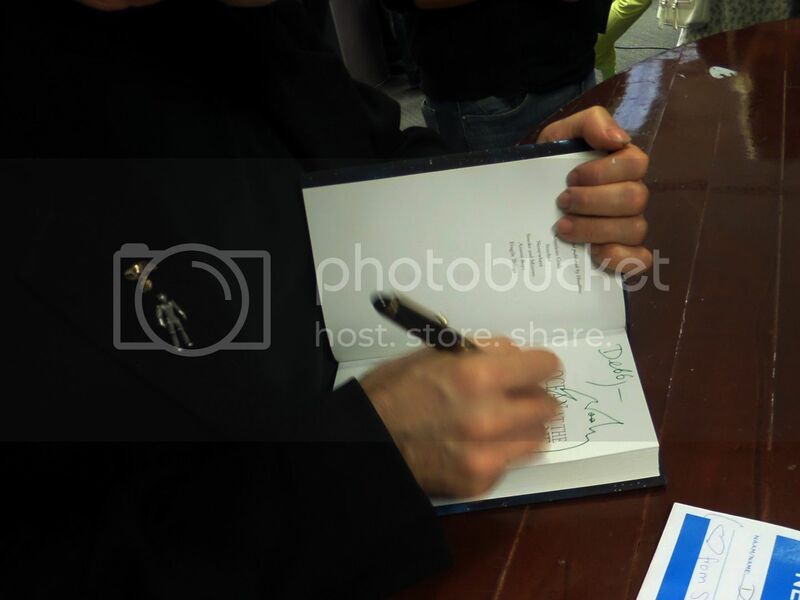 Maybe I'll try someday mentioning my blog to authors at signing and see if they remember. Haha, which they won't, because I would most likely not contact them at all. But I'm glad you were able to go to the event! He sounds awesome. EEEEEEEEEEEEEEEP I'm kind of freaking out a little over here !!!!!!!!!!!!!!!!!!!!!!! He seriously sounds like the coolest person ever and I love the lines you quoted (he's hilarious) and he sounds so adorable when talking about his wife and ahhhhhh. I love that he recognized you and it's such an honor and that he kept talking to you and I'm rambling and a bit jealous but it's SO AWESOME. Also, I'm all kinds of sad that I missed it. NEXT TIME THOUGH! My recent post Review 186. Jane Nickerson – Strands of bronze and gold. 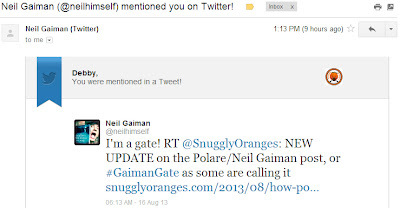 Clearly writing a blog post about Gaiman Gate was the best life choice you ever made. He really is an amazing man. I wish I loved his books as much as him in general. They're really good, but I sadly do not get feels from them. Ah well, what can you do? I do that same thing with Dutch and German. They're close enough I ALMOST know what it says. Like if I bring my English and German skills to bear, surely I can puzzle this out. Sometimes yes, sometimes no, depending on how much context I have. AWWWW, HE HAS A SPECIAL SMILE FOR HIS WIFE. THAT IS SO SWEET. PARDON ME WHILE I FLAIL. "It appears that I've written a book. Sorry." LOL, though I would still say it's more novella length, but I'm not sure how much such distinctions matter. 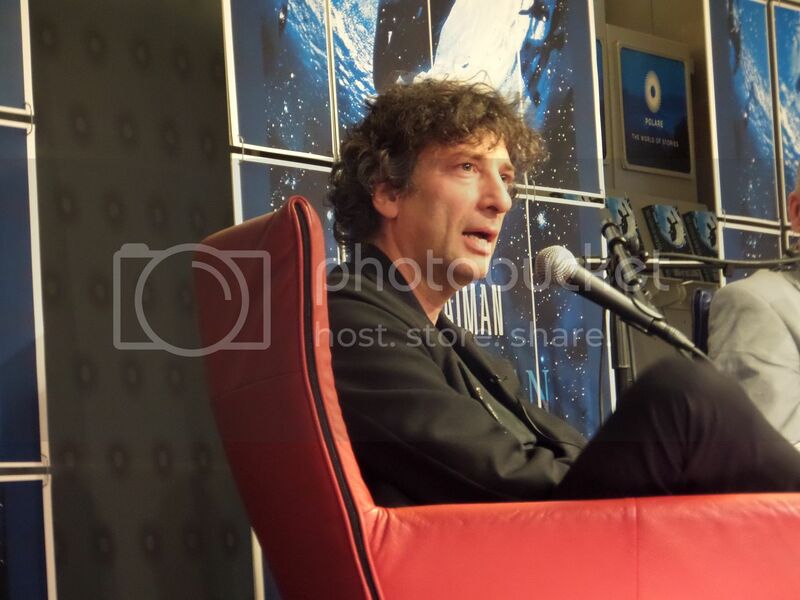 And I am probably using an incorrect definition of novella anyway, bc he is Neil Gaiman. IS THAT YOU? You're a real person! You're not an orange with legs and arms. MY WORLD IS EXPLODING.